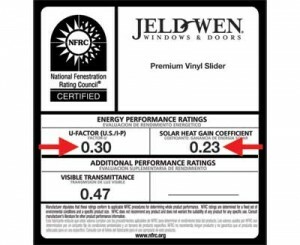 Energy performance ratings let you know how well your windows will perform when it comes to keeping out extreme temperatures and sunlight’s UV rays. 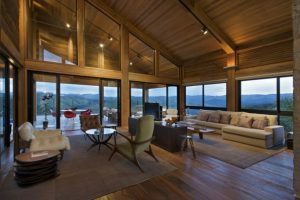 Energy performance ratings for windows and doors tell you the potential for gaining and losing heat as well as for transmitting light into your home. Ratings are typically broken down into measurements that include R-Value, U-value, solar heat gain coefficient and visible transmittance. Our labels show National Fenestration Rating Council ratings, including U-factor, solar heat gain coefficient and visible transmittance. U-value (or U-factor) measures heat transfer through a material, establishing the rate of that heat transfer or loss. Lower numbers mean less heat transfer and therefore more insulation. A double-pane window with Low-E filled with Argon Gas typically has a U-value of 1.53. U-values determine heat gain through a window in summer and heat loss in winter. SHGC measures how much heat from the sun is blocked, expressed as a number between 0 and 1. The lower the number, the more a product blocks solar heat gain. Blocking solar heat gain is especially important during summer in hot climates and during winter in extremely cold climates in order to save on cooling or heating costs. VT measures how much light comes through a window, expressed as a number between 0 and 1. The higher the VT, the more light is transmitted through the glass. 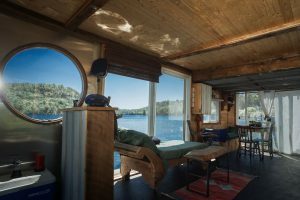 Clear glass lets in the most light but also the most heat, whereas a low-E coating makes it possible to reduce solar heat gain while allowing visible light to pass through glass.